Discovering the network by scanning all possible channels & listening to beacons is not considered to be very efficient (passive scanning). To enhance this discovery process, stations often use what is called active scanning. 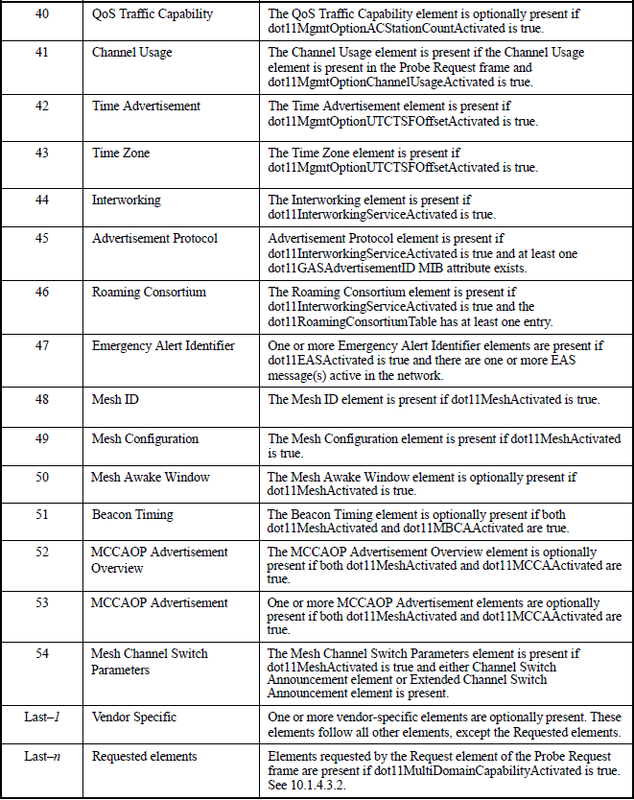 In Active scanning, stations still go through each channel in turn, but instead of passively listening to the signals on that frequency, station send a Probe Request management frame asking what network is available on that channel. Probe Request are sent to the broadcast DA address (ff:ff:ff:ff:ff:ff). Once a Probe sent, STA starts a ProbeTimer countdown & wait for answers. At the end of the timer, STA process the answer it has received. If no answers received, STA moves to next channel & repeats the discovery process. 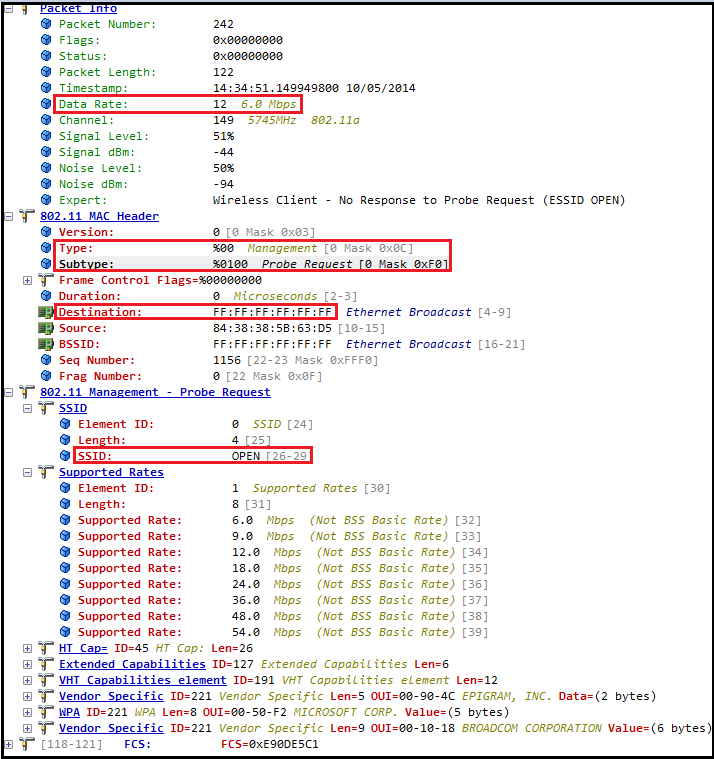 STA sending Probe Request may specify the SSID they looking (called directed probe request). 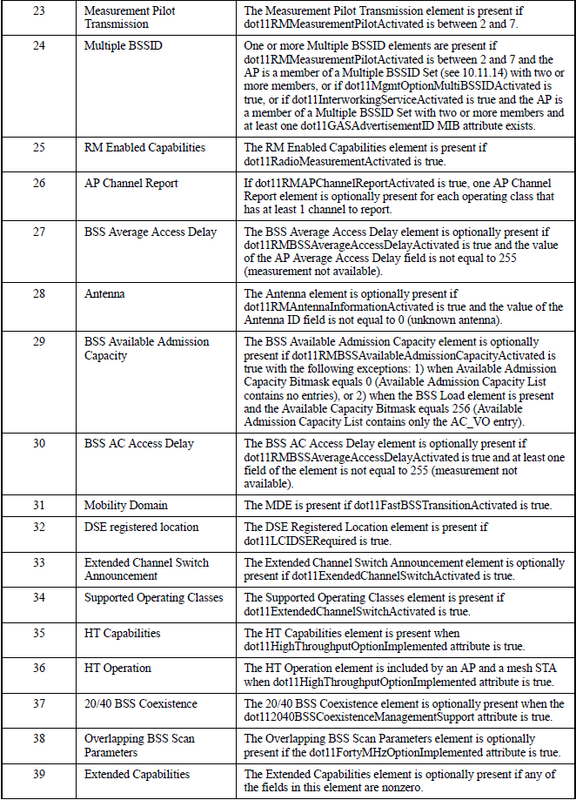 Then only IBSS STA or AP support that SSID will answer. The SSID value can also be set to 0 (ie SSID field is present, but empty). This is called Wildcard SSID or Null Probe Request. Here is a frame capture of a client association to a BSS. 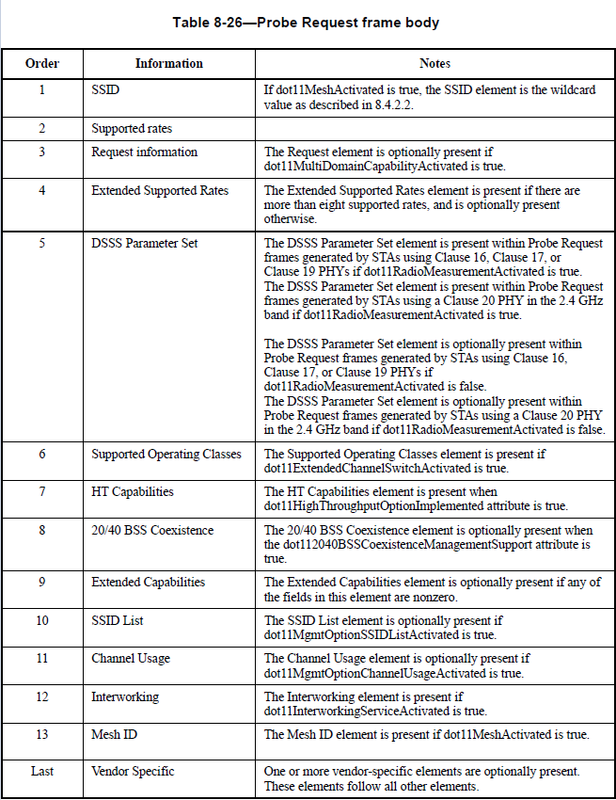 Highlighted the Probe Request/Response frames. SSID field set to “OPEN” indicating it is a directed probe request. It list all supported rates, HT capabilities, Extended Capabilities, VHT Capabilities & other vendor specific attributes of the client. 3. The probe response contain the Requested Information elements that may have been requested by the probing station. 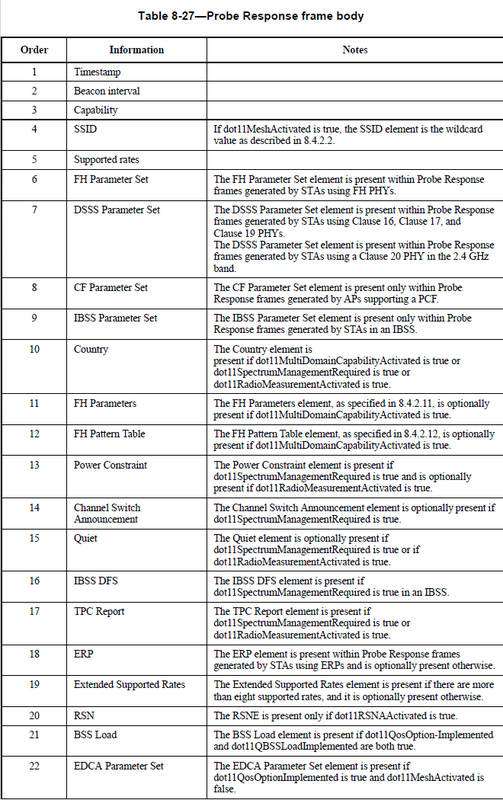 Here is the complete list of field that can be in the frame body of a Probe Response frame. 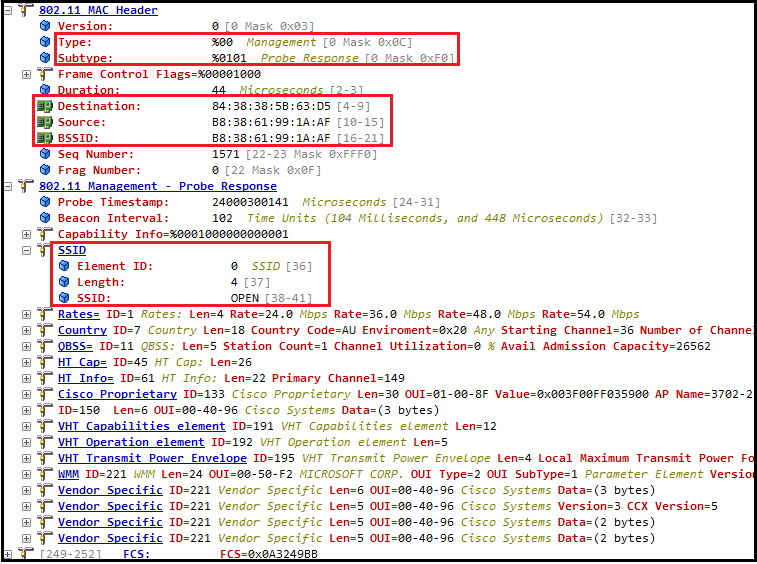 (source IEEE 802.11-2012) Once Probe Response received by the STA, it should send an ACK frame to the AP. This frame sent on lowest common rate which is 24Mbps in my case. Here is the Probe request detail in this case. Note that SSID field set to 0 & sent in in lowest rate supported by client which is 6Mbps in this case. Shouldn’t the AP answer the PROBE REQUEST with the lowest mandatory (!) rate? when 2 AP sends a probe response, which one STA connects to and on what basis it makes decision. I’m a a newbie, I need this for my study. How you send the probe request message? Is there any tool for send probe request? 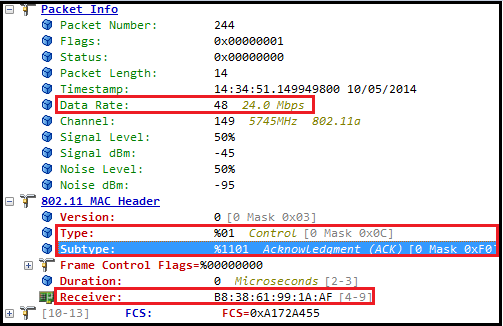 Can it be send to specific MAC Address of an access point? Probe request sent by any wireless client device looking for an SSID to connect. Hello, I would like to discuss a problem with you: we can get ssid which the device has been connected through capture probe req.so,is there any way that you can get the mac address of ssid which the device has been connected ?I hope to receive your reply as soon as possible. Hi, Your device is doing active scanning. 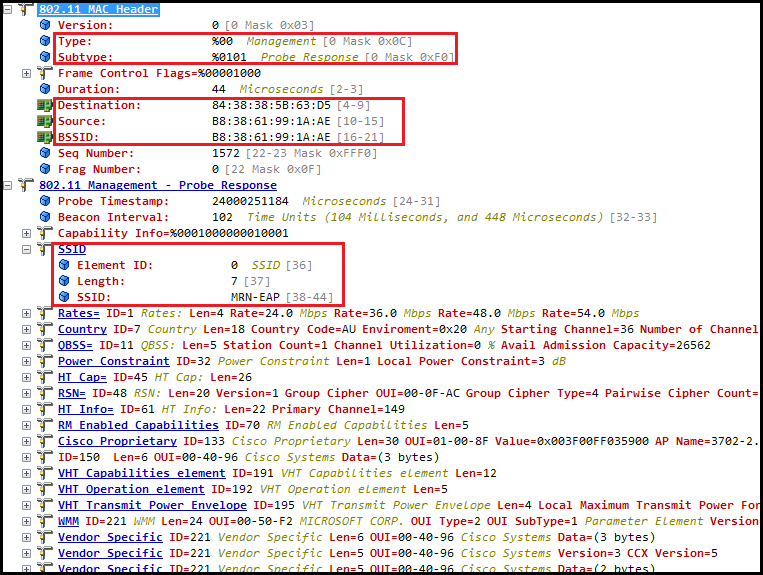 So, the client will scan all the channels actively and sends probe request on all the channels looking for an SSID. At this stage you will not be able to see the BSSID/ MAC address of the SSID. 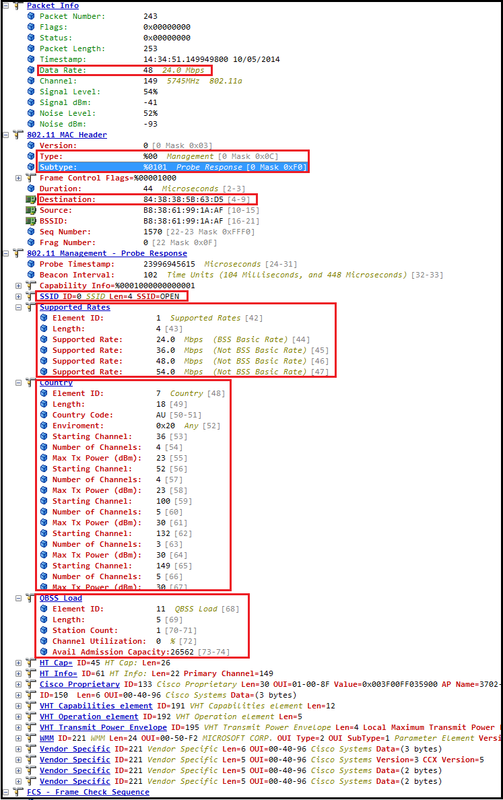 You have to check the probe response frame coming from the AP for the BSSID info. Thank you very much for the posts. I would apprecita if you could briefly explain how Duration fields are calculated in probe request/request. I see on the screenshots that in probe request it is 0 and in probe response it is 44. how 44is calculated here?